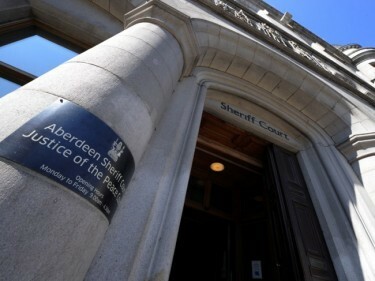 A woman was arrested for smashing a pint glass over her partner’s head during an argument in an Aberdeen pub. Zara Bremner and Liam Smith were drinking in the Mither Tap on John Street in the early hours of Sunday, February 24 when they began to row. Aberdeen Sheriff Court yesterday heard that the 24-year-old, of 51 Beechwood Court, left her partner gushing blood from his forehead and lip when the situation turned violent. Fiscal depute, Rebecca Clark, said: “The accused and Mr Smith live together and had been drinking together that night. “They began to argue in the pub and the accused suddenly stood up and, from a close distance, threw a beer glass at his head. Police quickly attended the scene and viewed CCTV footage of the incident. The accused admitted a charge of assaulting Mr Smith by “throwing a glass at him, striking him on the head to his injury”. Defence lawyer, Laura Gracie, said: “There had been no police involvement between the two of them prior to this, and the cuts were only superficial. “Unfortunately, my client has no recollection of carrying out this assault. However, Sheriff Aitken deferred sentence for six months to allow Bremner to show that she can be of good behaviour.